What developed your passion for rugs? My parents had 2 furniture shops in Belgium. I’d spend all my weekends roller skating and playing hide and seek with my sister in the beautifully made up beds and sleek leather sofas. As a child I made my own pillows and backpacks out of leftover fabric samples I’d ‘instructed’ my parents to bring home for me. 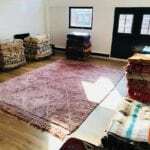 However, my interest in rugs did not arise until much later, while travelling with my partner to Turkey and Morocco. I’ve always been drawn to colour and happy shapes, which is still clearly reflected in my current selection of rugs. How do you go about selecting each rug? Sometimes you get a real diamond in the rough moment. I always make sure I’m equipped with a super sweet mint tea and prepared for sneezing away the dust from the much older pieces. Often this means browsing through piles of rugs and screening tons of to assess wool quality. Where should you put your rug in relation to the room? Anywhere it works really! No rules, just fun. That being said, wool rugs don t survive long in bathrooms, and kilims should be made non-slip with a rug pads if they’re going in a bathroom. But that’s easily avoided with a bit of rational thinking. . These days a rug under a dining table is best at 250cm wide, and not 200cm as used to be the norm. For bedrooms, I think there are many “correct ” solutions, from behind the bed; to the bed half on the rug; to all furniture on the rug (if they all fit). Why are rugs so important for interior design? In my opinion it is about the texture and how it mixes in with the room. If you use a feng shui colour palettes or more of an intuitive style compass, a rug needs to have that extra wow element. You can often work around a rug with a difficult size, but the right texture is of key importance to add that extra charm to a room. Colour is obviously the second runner up here! It needs to blend in or stand out and represent your personal taste. What should you look for when buying a rug? You should look for something that you think stands out from the crowd! 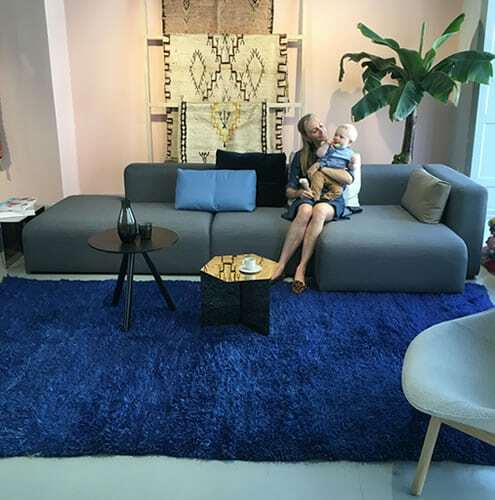 And in some cases that means a rug that is a statement piece with lots of colour and stand out, for others it means something that is more serene and blends in. If you need some advice in choosing a rug, read our helpful guide here. What sort of rug would you recommend for a small space /large space? Small spaces benefit from colourful rugs and highly decorative pieces, in my opinion. Large rooms function best with more serene rugs, as there is often lots of other things present to attract the eye. Bedrooms are somewhere in between, and can benefit from both colourful or more serene rugs. Should you have furniture on or off the rug? If the rug and furniture allow it, then all on is a great way forward. Vintage rugs however do not often make this possible as sizes are often long and relatively narrow but they do give that extra character to a room that other rugs don’t offer. With vintage pieces you can often work around the sizing and put just the front legs of the sofa on it. As mentioned above, in a bedroom more options will flow more easily with a rug fully or partly behind the bed. I like anything with a symmetric sort of look, and anything with dots is always attracting my attention. A good colour combo is definitely interesting too. How does your collection of rugs reflect your style? I like things that have a bit of elegance yet with a twist. I like colour and I like to mix it with …more colour. Black is definitely not the way forward for me. I have a large pink pile rug under my dining table and some flatweaves next to the sofa. It’s probably be better the other way around – but for now I like it this way! How has your collection changed over the years? Over the last years I have also started doing more new made rugs. Still all one off pieces that are highly unique, but in super large sizes. They are great for the larger living room or for floating seating areas. They are no replacement for the vintage pieces but in fact are complimenting the collection by offering super sizes. 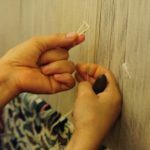 How To Tell If a Rug is Handmade We’re Moving – Back to London!